This paper presents a sensorless method for determination of the load current of an automotive generator applying a neural-fuzzy implementation. We developed a simulation model of the automotive generator and its voltage regulator in order to get information about its behaviour at different operating conditions. The model takes into consideration the nonlinearity caused by the saturation of the magnetic flux and the effect of the shaft speed on to the internal impedance. The simulated results are compared to those that are available in the literature and to the results gained from real system measurements. A laboratory test rig was developed to study the operation of the automotive generator and voltage regulator in different conditions. In contrast to general spread methods in this area the measurement results are plotted in 3D to emphasize the hidden operation fields. In the operation of the system the parameters of the DFM—Digital Field Monitoring—signal have important roles. Both the frequency and even more the duty of the DFM signal carry on important information about the condition of operation of the automotive generator and its voltage regulator, especially about the load current. This has an important influence on the whole system of the electric circuit of a car starting from battery to end consumers, different ECUs—Electronic Control Units—fuel consumption and emission of the ICE—Internal Combustion Engine. Applying neural-fuzzy theory, we could realize a sensorless method for this aim. 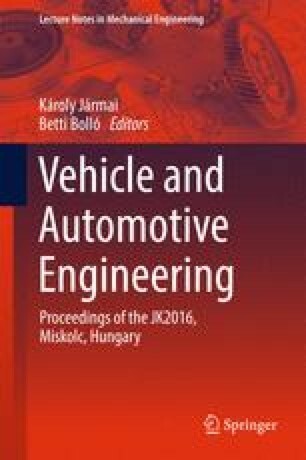 This research was carried out in the framework of the Center of Excellence of Mechatronics and Logistics at the University of Miskolc.